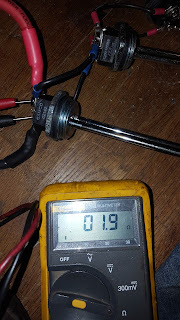 Today I connected 5 each (1500w/120v/10 Ohm) water heater elements (costing $5.00 each) in parallel which ended up with between 1.9 and 2 Ohm's of resistance. 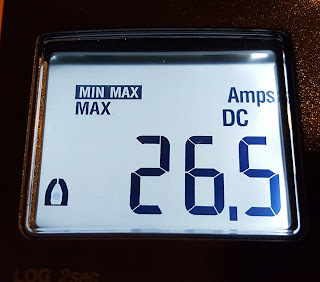 I was able to witness the voltage drop over the final Diodes from 53.9v to 53v. Which is very close to what the datasheet predicted for these dual diodes. I ran both bank(1) and bank(2) for this test today. The result was 26.5 amps pulled with a 0.9vdc drop after the final protection diodes voltage of 53.0v. 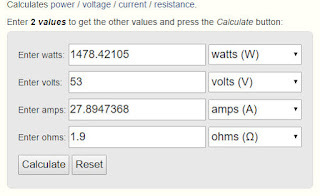 Based on the how the paralleled heating elements ohm'd at 1.9 Ohms the prediction was 27.89 amps @ 53v for 1478 watts total. 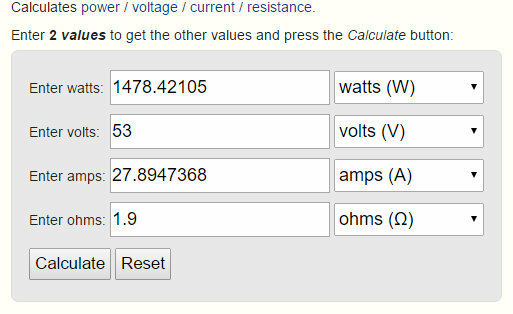 So prediction math vs. reality was off about 1.49 amp but at least the supply can draw nearly 30 amps using this test. 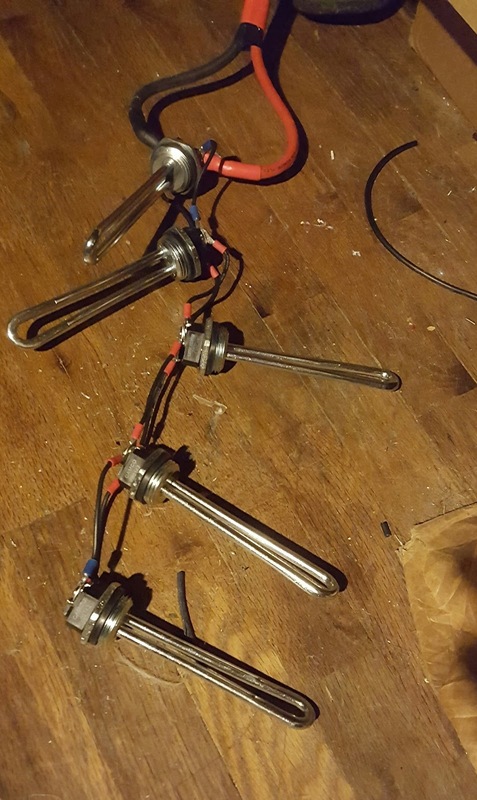 I have a 6th heating element I could connect as well. That would theoretically end up at 1.6 Ohms and 33.1 amps drawn. Currently the problem I have is that I can't run this test and let things remain at-load for more than about 10 seconds. I don't want these heating elements to overheat. And after just 10 seconds they are to hot to touch. I have a 10 gallon steel drum that I'm going to tap for these six heating elements. Then I'll fill it with water. That should allow for several minutes of testing. Apparently it would take abut 167 minutes or 2 Hours and 47 Minutes to 'boil' 10 gallons of water if Efficiency = 95% and the starting water temp was 50F degrees. So I'll probably add ICE to the water and get good and cold before I start any real testing. Although if the starting water temp was 80F degrees it would still take 136 Minutes to boil or 2 Hours and 16 Minutes. The idea is to not let the water get anywhere near that hot. Testing once that's working will be one minute ON on minute off (to simulate something like JT65A load's). For reference 30 amps at 53 vdc is enough to drive a single BLF188XR to full power output. I added the 6th heating element and indeed the Ohm's dropped to 1.6 Ohms when tested it yielded a draw of 32.4 amps. My 10 Gallon Steel barrel will be here tomorrow, and I'll try to figure out how I'm gonna mount 6 heating elements into it :-) More on that another soon I hope.